BIRATNAGAR, Feb 3: Neglecting public health and environmental degradation, most cities of Province 1 have been disposing their waste out in the open. Despite being aware about the piles of garbage on the streets, alongside roads, rivers and other places, the local governments have shown no concern to solve the waste management problem which can possibly trigger an epidemic. It is the responsibility of the local government to take initiative to protect the rivers and environment. According to the law, it is illegal to dump waste or connect sewer pipes to rivers. But the locals of the largest metropolitan city and the capital of the province, Biratnagar, have turned riverbanks into dump yards due to the lack of a landfill site. The waste collected everyday is dumped along the banks of the Keshlaiya River. Monsoon flood often moves this waste towards human settlement making living difficult for the locals. At other times, various animals and birds carry the rotten garbage to the settlement areas. Hira Lal Yadav, chief of Biratnagar Metropolitan City Waste Management Department, informed Republica that locals have been allowed to dump waste along the river, as the metropolis is yet to find a permanent landfill site. "We don't have a permanent landfill site, so people have been allowed to use Keshlaiya riverbanks as a temporary landfill site," said Yadav. A private organization named Waste Management Group (WMG) has been entrusted with the responsibility of managing the municipality's waste. Devi Prasad Acharya, chief of Waste Management Project of WMG stated that there is a provision preventing the disposal of waste in the river but not in the riverbank. "The accusation made by the locals that the garbage thrown in the riverside is inviting flies is totally wrong. They are pretty much common in the season of mangoes," said Acharya. Every day, 100 metric tons of waste is collected in Biratnagar where 65% is degradable waste while 35% is non-degradable. Dharan Sub-Metropolis is often considered the most beautiful city not just in the province but also in whole nation. It has also received award for maintaining cleanliness and hygiene. Though the city roads and public places may woo a lot of people but even this local unit is struggling to find a proper landfill site. 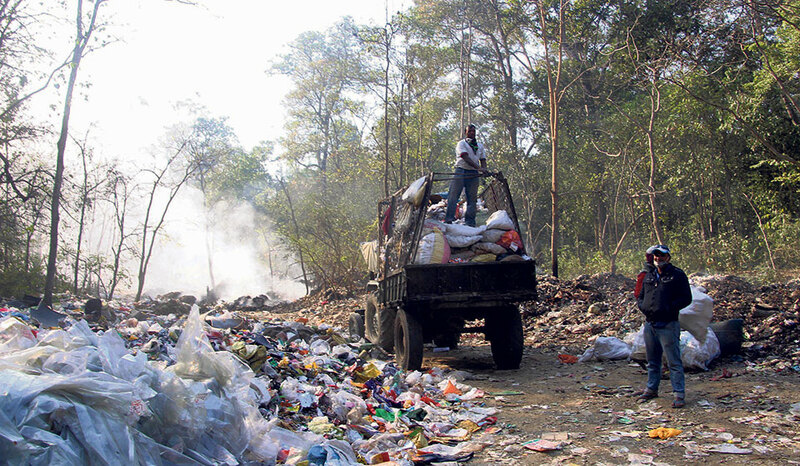 Everyday more than 45 tons of waste collected is collected from Dharan and is dumped directly in the forest. This has not just affected the wildlife but has also damaged their habitat, compelling them to migrate to elsewhere. This often creates a controversy between the officials of the community forest and the metropolis. The labors appointed for disposing the waste collect the waste from the major roadsides during night and take it to Seuti River area of Bajhgara Community Forest of Dharan-15. According to Bheshraj Ghimire, Environment Officer of Dharan, the local unit also collects waste of neighboring Sangurigadhi Rural Municipality. "People do complain about environmental degradation but we have been burying the non-degradable waste every four months," said Ghimire. The situation is no different in Itahari. As the local units disposes the waste in forests and burn that, it has not just polluted the land but even the air. Sometimes, the fire lit for burning garbage leads to wildfires. It has been two years since the locals have been dumping waste in Hansposa Community Forest of Itahari-20. Local authorities are preparing to generate biogas from the waste collected from three municipalities of Jhapa. The waste collected from Kankai, Arjundhara and Birtamod municipalities will be processed and used for making biogas. Mayor of Kankai Municipality says all three municipalities jointly took the decision. Asian Development Bank will be financially helping the project. The total cost of the project is Rs.170 million. ADB will bear 40% of the cost while the remaining cost will have to be managed by the municipalities.